Exempt Status letter for Rev. 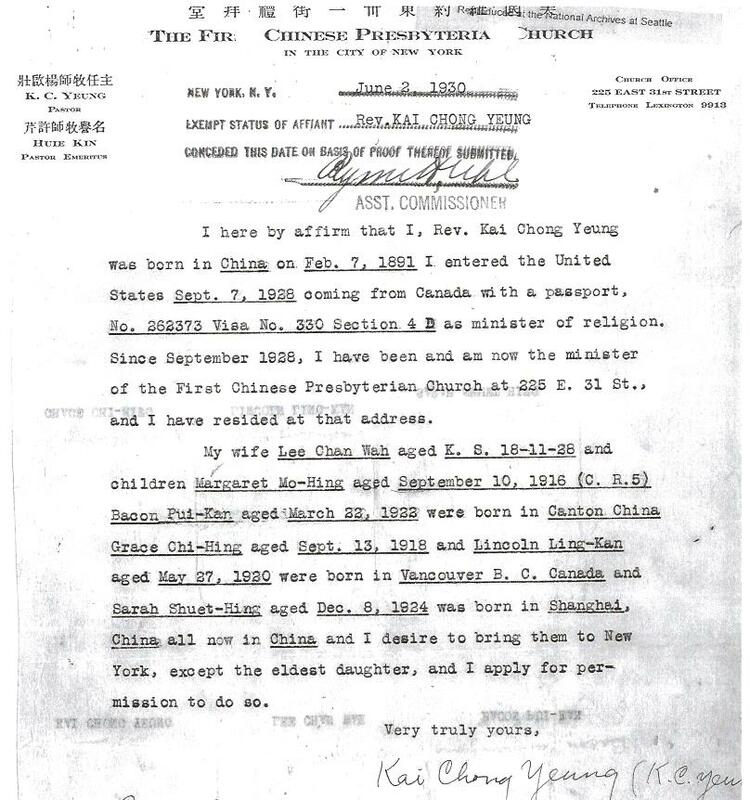 Kai Chong Yeung, 1930, Chinese Exclusion Act case files, RG 85, National Archives-Seattle, Lee Chan Wah file, Box 833, Case 7031/43. The 1924 United States immigration act specifically exempted from quota restriction professors and ministers of any religion as well as their wives and minor children. Roger Daniels, “Immigration,” Encyclopedia of the New American Nation, (http://www.americanforeignrelations.com/E-N/Immigration.html : accessed 14 August 2015). “Non-Quota Immigrants,” Public Laws of the Sixty-Eighth Congress of the United States. Sess. I, Chapter 190. 1924, p.155, (http://www.legisworks.org/congress/68/publaw-139.pdf : accessed 14 August 2015).